Jay Tessmer's road to the University of Miami, and Major League Baseball had many twists and turns, but his determination to succeed would help him make his dreams come true. A standout in basketball and baseball at Cochranton (PA.) High School, Jay was a three time all conference high school pitcher. He enrolled at Miami in 1991 and tried out for the baseball team, only to miss the cut his first two years, but the third time was the charm. Coach Jim Morris liked Jay's sidearm delivery, and Jay would make the '94 team and spend the season as a set up man for All American reliever Danny Graves. Tessmer began his UM career with a school record 32.2 consecutive scoreless innings to open the season. Jay led the NCAA in Earned Run Average (ERA) with a minuscule 1.16 mark, compiling a 6-2 won-loss record with 3 saves in 70 innings over 40 games. He was named an honorable mention All-American by the National Collegiate Baseball Writers Association (NCBWA) and was selected to play on Team USA in the Summer of 1994, helping prepare him for a sensational senior year. 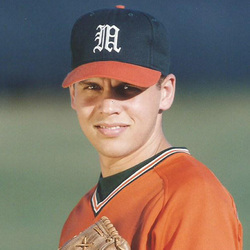 In 1995 as a team captain and the Hurricanes closer, Tessmer would garner first team All-American honors from Collegiate Baseball and the NCBWA while leading the nation with 20 saves. He ended the year with a 1.31 ERA, and a 3-2 record pitching 70 innings across 45 games, tying the then-school record for appearances. Jay was named the Most Valuable Player of the Coral Gables Regional by saving all four of Miami's wins to advance to their second consecutive College World Series. Jay is fifth in career saves with 23, and his 1.32 career ERA is second all-time for pitchers with less than 200 innings pitched. His 20 saves in '95 is tied for second in saves in a season, and he holds the Miami record for fewest walks per 9 innings at 1.42. Drafted in the 19th round of the 1995 Major League Baseball (MLB) draft by the New York Yankees, Jay would make his major league debut on August 27, 1998, and pick us his only MLB victory with two strike outs in one inning of work against the Los Angeles Angels in Yankee Stadium. He would spend parts of 1998-2002 in the major leagues with the Yankees, and also played in the Colorado Rockies and Milwaukee Brewers minor league organizations. Tessmer graduated Miami with a B.S. in Chemistry and he and his wife Tamara have three children, Avery, Rylee and Evan. They live in Boynton Beach where Jay is the South Florida regional project manager for Joe Taylor Restorations, a company that specializes in water, fire and mold remediations.